I am convinced that he was referring to the Marathon du Mont-Blanc. 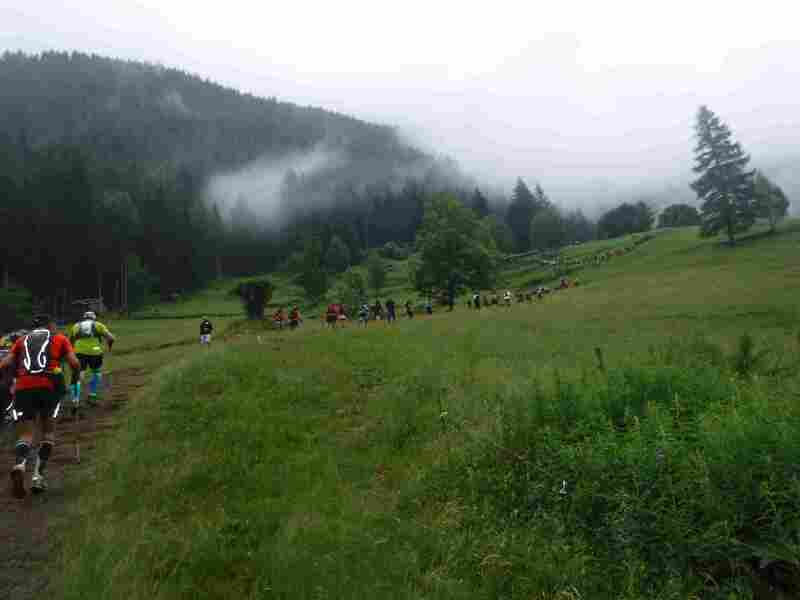 Thousands of trail runners flock to Chamonix in July every year. The Marathon du Mont-Blanc forms part of an extended weekend of trail races that takes place in the French Alps. Other races include an ultra marathon of 80 km, a 23 km, a Vertical Mile and a 10 km. Entries are limited and a spot in one of these races is highly coveted internationally. If you are lucky enough to make the starting list, here is a small rundown of what you need to know. The race is very popular globally, and many international athletes participate in it, but if you don’t have any command of French you will have to do some extra homework. Marathon du Mont-Blanc is extremely well organised, but most of the English in information letters was obtained by Google translate, directly from French to English. Some vital parts of information came out skewed and a lot of guessing and assuming took place on the participants’ part. The organizers responded very fast to inquiry emails, so that helped. Beautiful town of Chamonix, home of Mont-Blanc marathon. Traveling to Chamonix is fairly easy from the centrally located international airport of Geneva. We used a shuttle service and was dropped off on the doorstep of our accommodation in Chamonix after a short one-hour drive. A public bus service is also available and high speed trains frequent Chamonix from all over Europe. 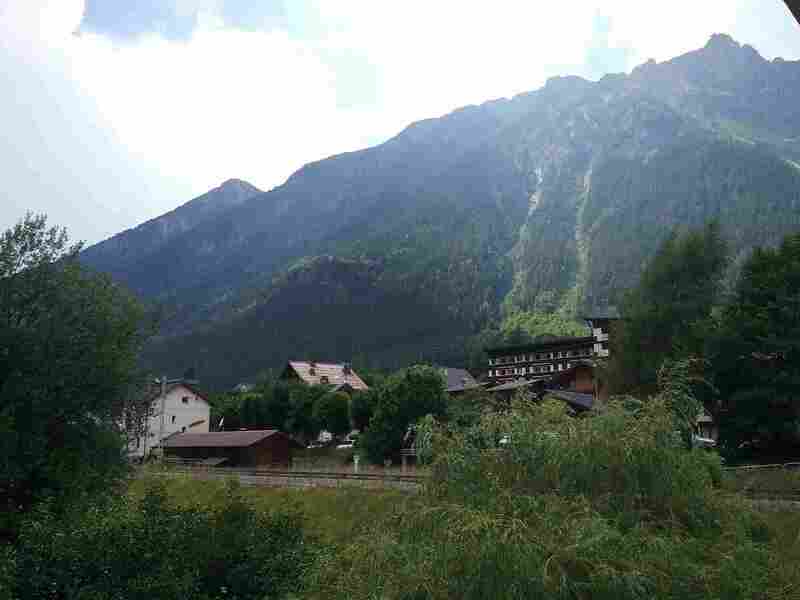 Alpine towns like Chamonix are very popular tourist destinations, but also not cheap. Eating in restaurants can play a number on your budget, so it is advisable to cook for yourself if possible. There are two or three larger grocery stores well out of the center of town, but worth the visit if you want to buy fresh products. Always carry your own water wherever you go, as buying bottled water is hugely expensive. The tap water in Chamonix is safe to drink, but some restaurants won’t serve you a glass of (free) tap water, preferring that you pay for bottled water instead. 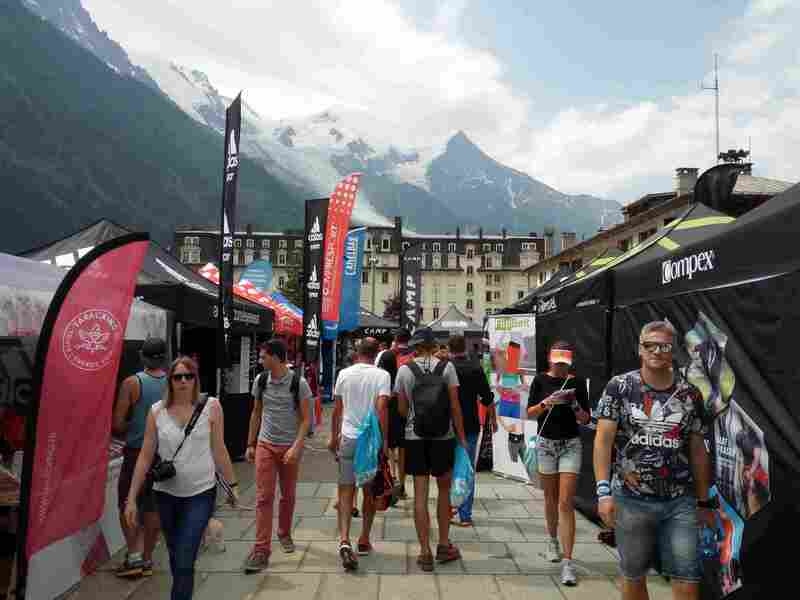 Registration and expo, Marathon du Mont-Blanc. Race expo and registration started on the Wednesday of race weekend, with ample time to register at leisure. Queues weren’t long and a great number of volunteers meant a speedy race packet pickup and gear check. Very little English is spoken by race volunteers, so if a runner had a specific inquiry or problem, the race director had to be consulted. Swag-wise the 2017 race pack wasn’t much to talk about. I expected a little more than just a few bags of free tea, and the technical race shirt wasn’t a Salomon original although Salomon is the main sponsor. But the race setting and scenery not the swag is what draw participants. A variety of high tech brands were showcased at the race expo. Any last minute gear shopping could be done, and high quality commemorative race shirts were on sale, but not at the discount prices you would expect from an expo. Chamonix brims with action sport stores that sell low to high end brand gear. It is harder to find a salad in town than a bargain on a pair of high quality trail runners, so personally I wouldn’t recommend shopping for essentials at the expo. 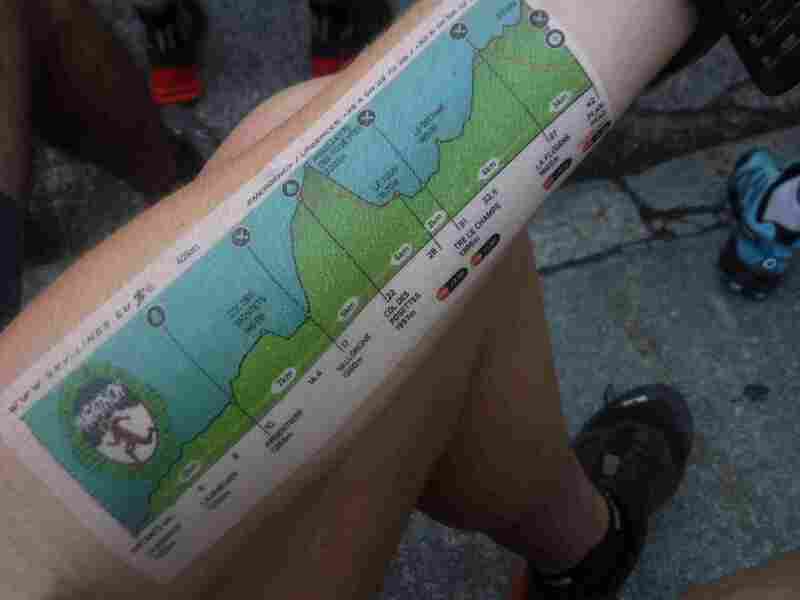 Runners received temporary tattoos with the race course. The marathon starts in the center of Chamonix town (1035 m) in front of the tourism office. Elite runners are called to the front and the rest of the 2000 runners just fall in where they like. The first 6 kilometers up to Lavancher (1248 m) is relative easy going, with wide-ish trails. This is a good place for runners to push for a better spot in the field, as the trails narrow up further on and passing slower runners on the flats leading up to Argentière at 10 km (1248 m) is difficult. The course follows well-marked, well-used hiking trails that wind along green hillsides and pastures, through tiny alpine towns and farms, up thick wooded forests and down grassy slopes, along glacial streams and across cattle paths. The views are extraordinary and changes from one minute to the next. From Vallorcine (1200 m) to Aiguillettes des Posettes (2200 m) the trail gains a full vertical kilometer over roughly 6 km of distance. If you are lucky the summit of Posettes will reward you with a breathtaking view of the Mont-Blanc range. Or it may be icy cold with wind and rain and fog with no view. Mont-Blanc is a very scenic but tough race. The first time cut-off is at the bottom of Posettes at Le Tour, which runners should reach within 5.5 hours (28 km total distance). This may seem like silly ample time to complete a 28 km run, but the altitude gain and loss makes make these targets tight for the average middle- to back-of-the-packer. A whopping ten percent of the field did not finish within the allotted time in 2017. 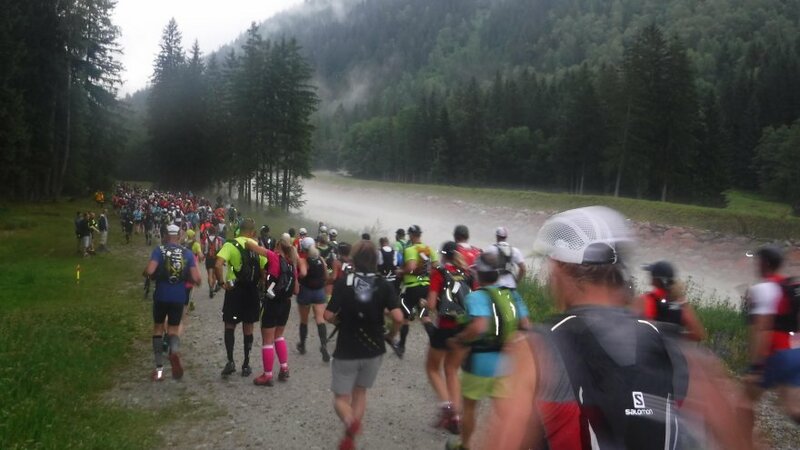 Another cut-off at Flegere after 7.25 hours prompts runners to finish the total distance comprised of 2700 m altitude gain and 2000 m loss within 9 hours. The race is very well organised, and despite most of the French volunteers having a poor command of English, they are extremely friendly and supportive. The race is stated as being semi-self supportive and runners are required to carry a minimum of 500 ml of water. For the faster runners this should be ample, as there are 6 water stations along the route of which four are fully stocked with water and energy drinks, bread, chocolate, salami, nuts and fruit. Plenty of volunteers man these aid stations and they are a welcome sight after sections of hard mountain running. The marathon route includes sections of high tourist traffic such at view points atop mountains. Ironically this is where runners are most tired, trails a narrow and more technical and hikers move slowest. This can cause some frustration and a lot of time can be lost. 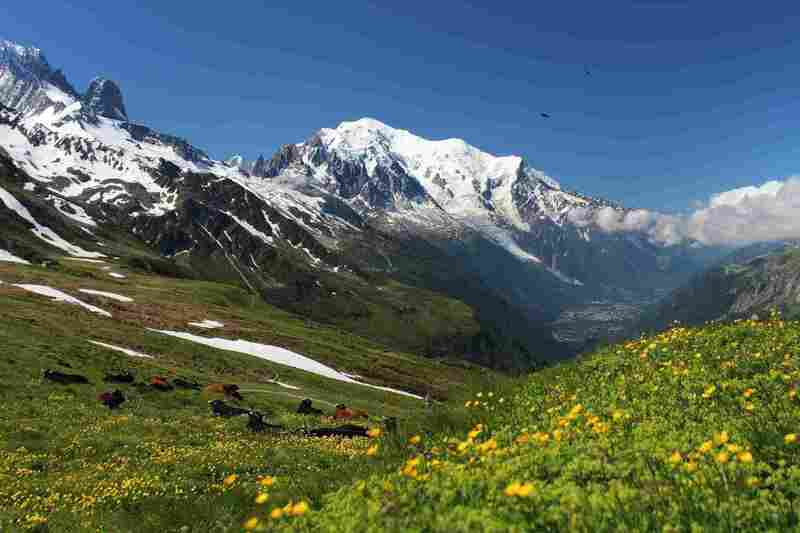 Beautiful Mont-Blanc mountain range in summer. Train on the specific hill gradients dished out by Mont-Blanc. Your body will thank you for it. Arrive a week early in Chamonix, if possible. Scout some sections of the route and get used to the trails and the altitude. Run the first 6 to 10 km of the race harder to get ahead in the pack. Take pictures when you have the opportunity! The weather can turn in an instant and views may be obscured. Don’t carry too much water or food. The aid station are well placed and fully stocked. Be forewarned of tourists and hikers on the trails that may slow your overall pace down. Just remember, the elite deal with them too and still finish in 3:45:45 (Kilian Jornet, 2017 male winner) and 4:40:36 (Megan Kimmel, 2017 female winner).